The rich cultural Andalusian city of Spain, Granada, is well known for its long ruling history by the Arabs, and their Islamic influence on the architecture of the city. The biggest standing example is, the Alhambra, a world heritage site, which was the last stronghold of the Arabs during their rule over Europe. Other than the culture and history, the University of Granada has played an important role in shaping the face of the city. The city is full of students leading to city's nightlife, cheap eats, free tapa bars & Moroccan teterias serving teas and sheeshah (hookahs) which brings the city to life. We have listed down few must visits in the city, which can easily be covered in 2 days time. Immerse yourself in the splendor of the city! Albayzin, the Moorish neighborhood of Granada, is characterized by its narrow cobbled streets and crisp white old style houses. The town also bustles with its local colorful and charming markets selling attractive Moroccan clothes, footwears, bags and much more. Street (Calle) Elvira, right in the heart of the city, is a charming and picturesque street with local Arabic shops and Moroccan teterias taking you into a vibrant nightlife. Just walk around this street and explore! I would recommend you to visit only in the evenings as most of the shops are shut in the daytime. This is the viewing point of the city. 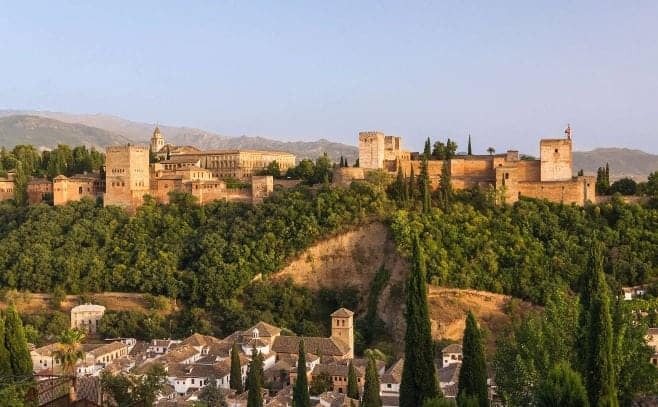 since Granada city is built on a sloping terrain, you need to climb the winding streets all to the top to enjoy the splendid view of the city and the fortress of Alhambra. The opulence and stunning beauty of this Basilica is worth a visit. The intricate gold work and the grandeur of this Basilica will leave you speechless. Yes, Spain is full of cathedrals & churches, but this one stands out! TO EXPERIENCE MOROCCAN FOOD CULTURE VISIT STREET ELVIRA & TO EXPERIENCE FREE TAPA BEERS AND LOCAL FOOD CULTURE OF GRANADA VISIT STREET PEDRO ANTONIO. GO AND EXPLORE! !